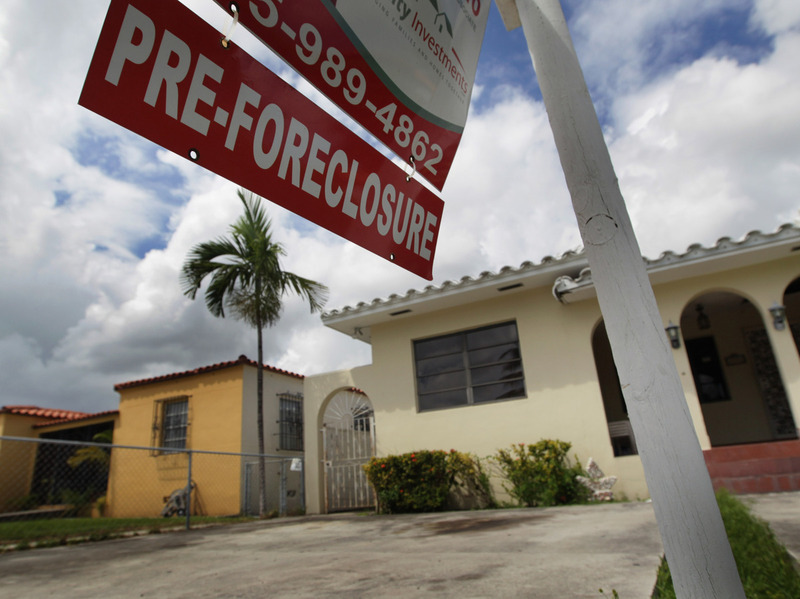 Foreclosure Process Hammers Florida's Housing Market As much of the country enjoys the start of a housing recovery, Florida is still being swamped by foreclosures. Experts blame the state's legal process, and they say it will be awhile before the housing market is fully rebuilt in the Sunshine State. A sign hangs outside a house in Miami in 2010. Currently, Florida's foreclosure legal process can take a couple of years, which critics say is hurting the housing market. A decade ago, speculators in Florida were pumping up a huge housing bubble. "You couldn't go wrong," Tampa real estate attorney Charlie Hounchell says. In that overheated period from 2001 to 2006, "you could buy a house and make $100,000 a year later by selling it," he says. But the party ended in 2007 and the hangover persists. The state now has the highest foreclosure rate in the country, beating out Nevada for the first time in five years. Experts say the legal process in Florida is the key reason for the sluggish pace of foreclosures there. The busy lobby inside the Hillsborough County courthouse in Tampa is noisy with defendants, lawyers, even crying babies. But inside a fourth-floor courtroom, it's all business — as focused and streamlined as possible. "I enter a final judgment of foreclosure for the total sum of $194,256.49 with a public sale date of March 11 at 10 a.m.," Judge Judy Pittman Biebel says as she delivers a verdict. The entire foreclosure trial took about three minutes. Biebel is a retired judge from Panama City, Fla., who travels to Tampa to sit on the bench for a week at a time — specifically to handle foreclosure cases. "We work cheap," she says with a laugh, "and we're paid $350 a day." The state funds these additional judges to help deal with the enormous backlog of foreclosures. One in every 32 Florida households received a notice of default, auction or repossession in 2012 — more than double the national average. Florida is getting it from both ends: Foreclosures are still coming in at a high rate, and they're very slow going out. In fact, it's taking nearly 2 1/2 years to get through the judicial process. Biebel says the courts stay busy. "Today was all nonjury trials," she says. "Yesterday was various motions all day long. So we sit and do this all day long. " And this speedy trial — over in just minutes — stands in stark contrast to the foreclosure process, which typically starts years earlier. Real estate agents say the backlog of distressed homes makes it tough for the Florida housing market to recuperate. Those homes depress prices and create uncertainty in neighborhoods. Why does it take so long to get these foreclosed houses back on the market? Analysts say the cumbersome legal process in Florida sets the state apart from other hard-hit states. But judges say they're not at fault. They say banks need to get a handle on finding promissory notes that have been shipped all over the country and on organizing their paperwork. Others, like Sharmon Lenth, blame foreclosure defense lawyers. She's the president of a small credit union that has been trying to foreclose on a house for years. She watched the proceedings from the courtroom gallery. "These people, they've lived in this house over 2 1/2 years for absolutely ... for nothing," she says. Lenth doesn't want the judge to give the homeowners any more time. "We worked with these folks," she says. "We worked with them starting back in 2008. We combined things for them so we lowered their payments. Eight months later we worked with them again, to help them to get through some tough times. They made 14 payments on that, they defaulted on it and hired one of these attorney groups." The homeowners didn't attend the trial, but their attorney, Satyen Gandhi, was at court. Gandhi said the loan modification expired after two years, leaving his client unable to make payments again. Biebel ended up giving the borrowers more than 60 days to leave the house. Lenth was disappointed. She says the members of her credit union needed to acquire that house and have it sold. "The whole process is just broke. It's just broke," she says. Lenth says unscrupulous foreclosure attorneys are using delaying tactics to tie up the process. But even with the complaints about the process, it doesn't appear that it will change anytime soon. Nor should it, says Hounchell, the real estate attorney. He says the judicial review is an important protection for homeowners — a protection that they don't get in most other states. "But comparing one state to another is not necessarily fair, because Nevada is a nonjudicial foreclosure state," he explains. "In Florida, the consumer has much more opportunity to remedy their default situation." They're going to need those opportunities, because experts say the foreclosure crisis won't end anytime soon.